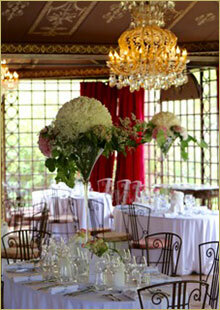 Best caterers of France for your wedding at the castle. Cédric knows the castle well and will be able to prepare breakfasts, brunch, barbecue, méchoui and tagines at very competitive prices. He also proposes delectable wedding menus. Almost 30 years of experience and local tradition, based in Corbeilles en Gâtinais, on the other side of Nemours. A culture of fine gastronomy with a hint of originality. Passionate authenticity and product excellence, Valerie and Bernard have gathered a strong team of professionals. Enthusiasm and mastery of the organization. Voted by Gastronomic newspapers as one of the most inspirational chefs, Dominique Maës always ensures that his world of flavours are explored in his restaurant in Bourron-Marlotte park. He has the culture of many local and noble products. Winter packages from 85€ without VAT, include a cocktail, table service and wines selected by the Sommelier Laurent Piro. Around €85 inc. VAT. A renowned chef whose delicious cuisine will add magic to a garden party, skilfully guiding you from the pond to the vegetable garden, from the rose garden to the walled garden... A unique approach to dining. Homemade Lebanese cuisine that you can enjoy 12 km from the chateau on the banks of Yonne (Misy-sur-Yonne). Both a cocktail idea and a wedding dinner. Founded in 1967, this upscale caterer cultivates art of hospitality "à la Française". Duval promotes exceptional products and invites you to share unique culinary and gourmet emotions between a tradition tableware, some custom creations and fine dining. He's the accomplice of your most unusual themes. Count € 180 / guest. A family business taken over by the son, Sami Guérault, discover a fresh, local, tasty and inventive cuisine, constantly renewed. A human team working for the culture of excellence. Download the brochure of its services for weddings at the chateau. Michelin guide **, chef Jean-Michel Lorain will bring you to an intimate world, treating you a unique journey through products transcended according to the seasons and his fancy. Lustyk supports the whole organization creating a special and personalized menu for cocktail and dinner, room decoration, tableware and scenography. He proposes several kinds of tailor-made services and provides his full savoir-faire to offer quality, varied and original services. From 80€+vat per person. Kosher caterer, Beth Din de Paris controlled. A wedding or a bar mitzvah means more than a simple reception: a moment of sharing and supreme joy. L’Arbre de Vie will go with you in these moments of happiness. At the community service since 1980. Catering through Julien & Fils Butchery under the supervision of the Beth Din of Paris. Highlighting its cocktails. Simply amazing! Beth-Din controlled and Kosher since 1988. Between €80 and €90 +vat, including decorating buffets. 1000 m2 lab catering in Aubervilliers. You just have to taste the Kemia Royale and the Mini Pastillas. Amel has 2 facets: Halal cuisine plus Oriental staging and decoration.